While the Strip is brimming with over-the-top excitement, the secluded Lake Las Vegas is a refreshing retreat for those who prefer a less crowded resort. This picturesque community was built around a 320-acre man-made lake and evokes the style and architecture of the Mediterranean coast of Italy. The property was designed to appeal to permanent residents, resort guests and day trip visitors alike. In addition to a marina, three hotels and a country club, the community features a quaint village complete with cobblestone roads, shops and restaurants. While it’s only 20 miles southeast of Las Vegas in Henderson, guests will feel like they are in a world far removed from the Strip. 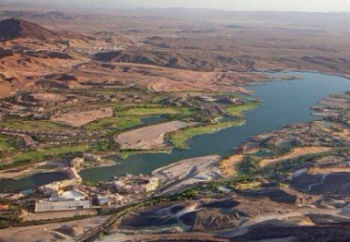 The idea for Lake Las Vegas began over 40 years ago, but the artificial lake wasn’t completed until 1991. The lake was created by an 18-story dam that builders claim contains as much dirt as the Hoover Dam contains concrete. Since surviving the recession in 2008, Lake Las Vegas has continued to develop with the aim of being tourist-friendly yet secluded and sophisticated. Today, the 3,592-acre community looks like a piece of the Mediterranean sprung up in the middle of the desert. The lake features various sand beaches surrounding architecture. The area is popular for weddings, professional retreats, family vacations and romantic getaways. 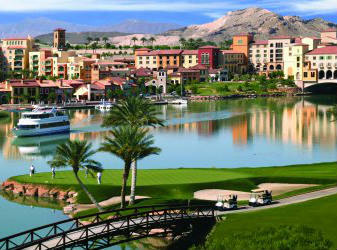 The social center of Lake Las Vegas is the Village, which is part of the Aston MonteLago Village Resort. This quaint, pedestrian-friendly area was designed to replicate an old Italian village and features charming fountains, eight boutique shops, various eateries, a grassy park and beautiful views of the lake. This area is popular for wine walks, beer festivals and concerts throughout warmer months. During much of the year, the Village hosts jazz performances on weekend evenings. In winter, the floating stage area is converted into an ice skating rink. For those who like to take in the outdoors, the Village is also a great place to go for a stroll during a nice day. For those who seek a little more excitement, the Auld Dubliner serves drinks and Irish-American food late on weekends. Next door, at the foot of the Village, is the MonteLago Casino. As the only 24-hour casino in Lake Las Vegas, it features 40,000 square feet of gaming with slot machine favorites and the latest technology in electronic table games. The Lake Las Vegas Marina is also located in the village and offers several ways for visitors to enjoy the lake. Stop by during the daily marina hours of 8 a.m. - 7 p.m. to rent watercraft such as 18-foot electric boats, yachts, jetskis and more. True to its Italian theme, the marina also offers gondola rides. Fishing is only permitted during certain times of the year (when the lake has been stocked), so be sure to check with the marina. In addition to the Aston MonteLago Village Resort, Lake Las Vegas is home to two other luxury hotels: Hilton Lake Las Vegas Resort & Spa and Westin Las Vegas. 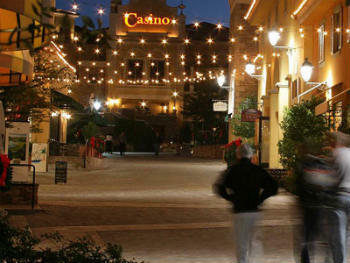 While these hotels do not have casinos, they are within walking distance from the village. Both the Hilton and Westin offer guests the ability to play the private South Shore Golf Club, which was designed by legendary golfer Jack Nicklaus. The Hilton Resort features three dining options, a pool area and a lakefront beach; however, this property is most known for the relaxing Revella Spa. The Westin, which is the only hotel located on the north end of the lake, also features a spa as well as three restaurants, including the high-end Asian-themed Marssa. The MonteLago features eight restaurants/quick-bite options in the Village. For those who want an even more secluded environment, Lake Las Vegas Vacation Villas are also available. These vacation homes allow guests to experience how Lake Las Vegas residents live and feature full kitchens, beautiful views and spacious rooms.